What is the difference between the daily mitzvah to remember our redemption from Egypt and the annual mitzvah, which we observe on the evening of the 15th of Nissan? Acharonim offer a range of answers. We sill survey a few of them. R. Chaim Soloveitchik argues that the daily mitzvah is a subcategory of reciting shema, while the annual mitzvah is its own independent mitzvah. He bases this approach on the Rambam’s omission of the daily mitzvah from his Sefer haMitzvos and from the headings of Yad haChazakah. This omission indicates that the daily obligation is not an independent category. Additionally, R. Chaim bases his approach on the Rambam’s codification of the daily mitzvah within the laws of Shema, which further indicates that it is a subcategory of Shema. 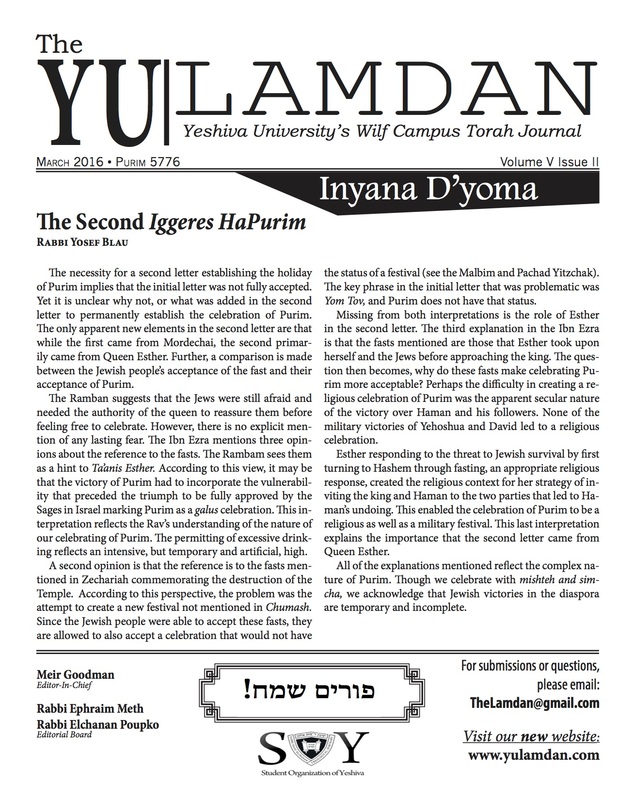 Based on this, the Rav (Harerei Kedem, 80) argues that the daily mitzvah may focus on any aspect of the redemption that relates to kabbalas ol malchus shomayim – and can even be fulfilled by reciting the Shiras haYam, “Az Yashir,” that ends with the words “Hashem yimloch leOlam va’ed” – while the annual mitzvah must focus on events that historically transpired on the fifteenth of Nissan, which is to the exclusion of Az Yashir. R. Aharon Soloveitchik (Parach Mateh Aharon, Krias Shema 1,3) interpreted R. Chaim’s position differently. According to him, one can only fulfill the daily mitzvah by reciting the third section of Shema, whereas the annual mitzvah can be fulfilled by recalling the redemption in any way. R. Aharon Soloveitchik acknowledges that some opinions in the Talmud permit us to fulfill the daily mitzvah with prayers other than the third section of Shema, but R. Aharon opines that the Rambam deemed these opinions as non-normative. In contradistinction, the Shut Binyan Shlomo suggests that the daily mitzvah may be fulfilled in any language, while the annual mitzvah may only be fulfilled be recalling the redemption in Hebrew, and perhaps only by reciting the passage of Arami oved avi. The Binyan Shlomo bases his idea on the Ramo’s ruling that we should read the haggadah to people who don’t understand Hebrew in a language that they understand, or should explain the Hebrew haggadah to them. The word “or” can mean one of two things. It could mean that both options are acceptable, and that we should tailor our conduct according to the best option we are presented with, based on the situation that we are in. However, Binyan Shlomo suggests that “or” means that it is insufficient to read the haggadah in a foreign language, rather we must read it in Hebrew, and help our audience understand by translating or explaining. While the Binyan Shlomo’s approach is unique, it is nonetheless consistent with the spirit of the Seder night. Speaking in a uniquely Jewish tongue is an expression of freedom, and we merited the redemption partially because we never abandoned Lashon haKodesh. Interestingly, R. Chaim’s students quote an alternate explanation of the difference between the daily mitzvah and the annual mitzvah. The daily mitzvah does not require dialogue, while the annual mitzvah can only be fulfilled via conversation. Moreover, the daily mitzvah can be fulfilled with a brief remembrance, while the annual mitzvah requires a more lengthy discourse.